Beekeeper Day is an official professional holiday in Ukraine celebrated on August 19 every year. It was established by President Leonid Kuchma in 1997. The idea of celebrating Beekeeper Day was first voiced by the Ministry of Agriculture of Ukraine and the Beekeepers Association of Ukraine. They were supported by the President, who issued an official decree on August 15, 1997. Four days later, Beekeepers Day was celebrated for the first time. 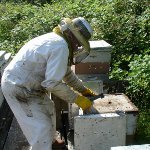 The holiday was established to recognize the input of beekeeping to the economy of Ukraine. According to the FAO report published in 2007, Ukraine was Europe's number one honey producer. By the way, commercial beekeeping was founded in the early 19th century by Ukrainian beekeeper Petro Prokopovych. Prokopovych was the first to use frames in beehives. Ukrainian Beekeeper Day is celebrated with agricultural fairs, honey tastings, awards ceremonies, conferences, round tables, concerts of folk music and dance and other events and activities. It is not a non-working holiday unless it falls during a weekend.